When it comes to the king of fruits, it’s either you love it or you hate it. And to the ones who love it, there are several dessert options that take the pungent, creamy fruit to the next level. As a soft serve, piped into a pastry, infused into local desserts or even into a cake, and so much more, durian’s application is basically boundless. If you’re as mad about durian desserts as we are, you’ll be thrilled to know that there is much more than just your average durian puff. 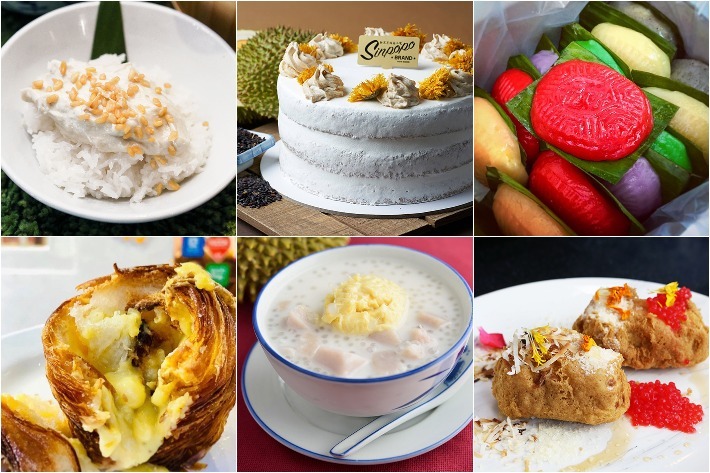 Here is our guide on 16 durian desserts in Singapore. A busy day in Bugis might have you craving a cold dessert. For that, the ever popular Ah Chew Desserts sells over 50 choices of traditional and modern Chinese style desserts. 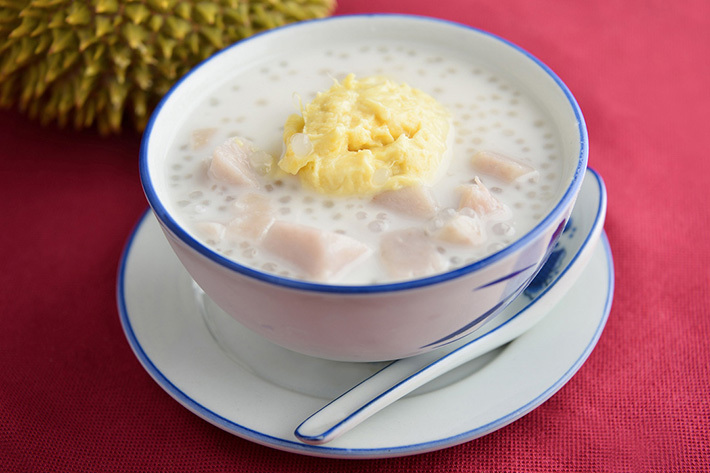 For some durian deliciousness, Durian Yam Sago (S$4.90) has a rich creamy puree topped with fresh durian flesh, sago, and bits of yam. This dessert is an almighty version of a bubur cha cha. 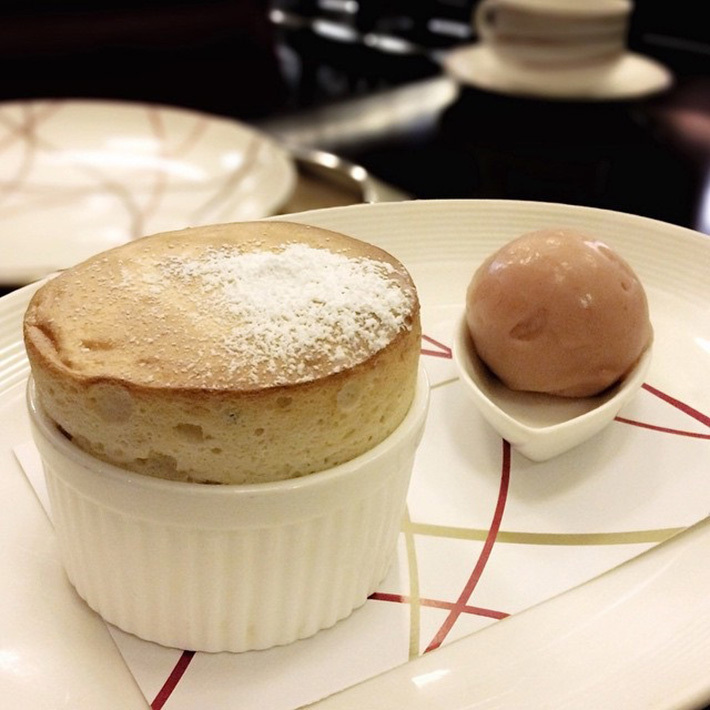 It sounds almost contradictory for “durian” and “light” to be in the same sentence, but DB Bistro & Oyster Bar manages to bring the two together with their Durian “Royale” Soufflé (S$18++). This Mao Shan Wang soufflé has a distinct taste of durian without being too cloying. It also comes with a scoop of refreshing mangosteen sorbet on the side to balance out the flavours and textures. Spotted: fried durian cake. 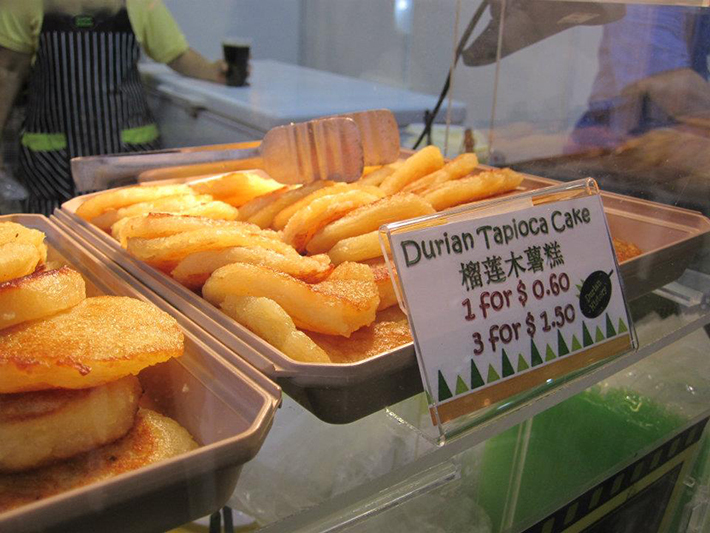 This chewy Durian Tapioca Cake (S$0.80) is the cheapest on our list and sold daily at Durian History. It’s usually hot and melts in your mouth so we understand if it’s a struggle to stop at one. Besides, this corner stall in Chinatown also sells it at three for S$2. If you’ve got tourist friends, point them to this popular spot for a taste of the King of Fruits because they’ve got all sorts of durian desserts and tidbits. Ji De Chi makes durian feasting convenient with their many outlets. But for a different treat, try their Durian Sticky Rice Roll (S$6.90). 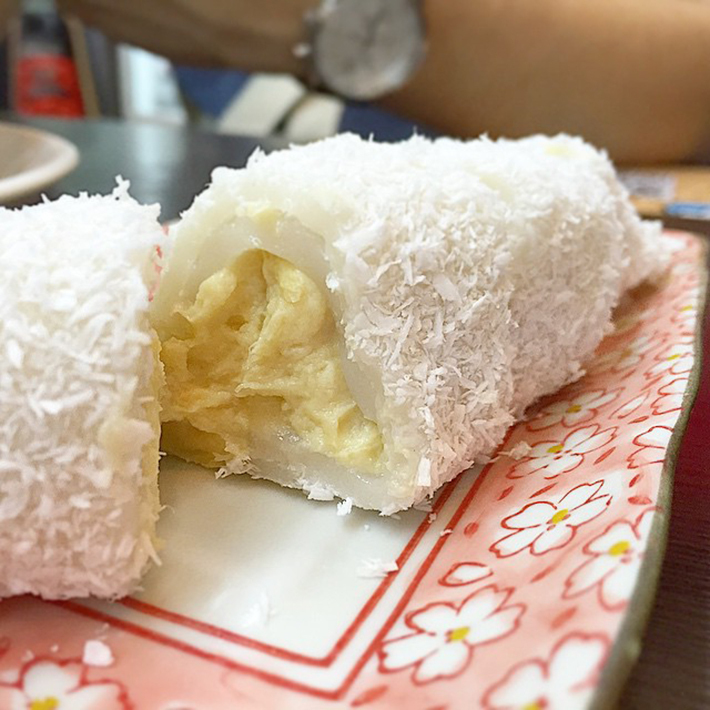 Semi-frozen durian flesh is stuffed into a chewy glutinous rice flour roll that’s covered in desiccated coconut, making it rich and creamy sweet. Their Durian Pomelo Sago (S$7.90) is popular with durian paste that’s thick like durian pengat mixed with sago and pomelo then topped with a scoop of durian purée. There’s still Durian Serradura (S$5.90) and Durian Snowy Ice (S$7.90) to complete your trip. 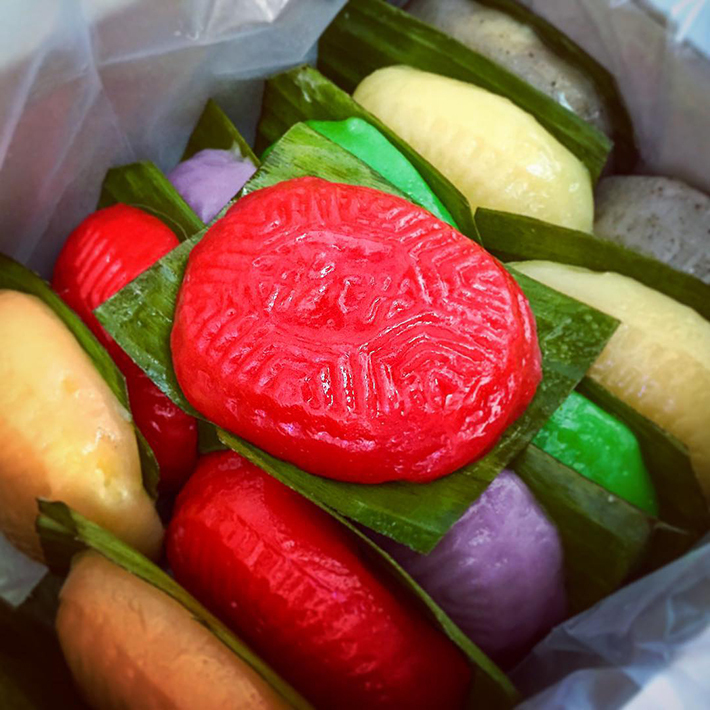 Hand-crafted ang ku kuehs are a rare find but Ji Xiang Confectionery still soldiers on since 1988. They maintain thin skins and generous mung bean fillings which give you a taste of yesteryear. Durian Ang Ku Kueh (S$1.70) is a seasonal treat and its price largely depends on the market. They have other updated flavours too like corn (S$0.90) and coconut (S$0.90) but if, for you, old is gold there are sweet bean (S$0.90), salted bean (S$0.90), peanut (S$0.90), and yam (S$1) flavours to add to the colourful collection. 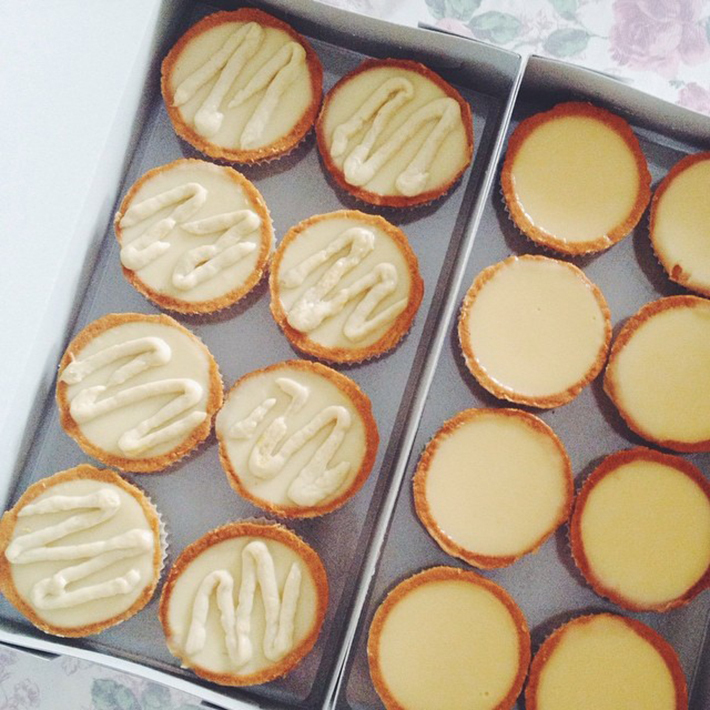 A number of places offer decent durian egg tarts but only at Le Cafe Confectionery & Pastry can you get Durian Bean Curd Tarts (S$12 for eight pieces). Do the sums and it’s S$1.50 for a piece. Silky smooth soya bean curd is nestled in a buttery pastry with D24 Mao Shan Wang puree on top. Our advice is to have them chilled and if you’re buying, order online or call a day in advance to be extra safe because bean curd tarts are available only after 1pm. 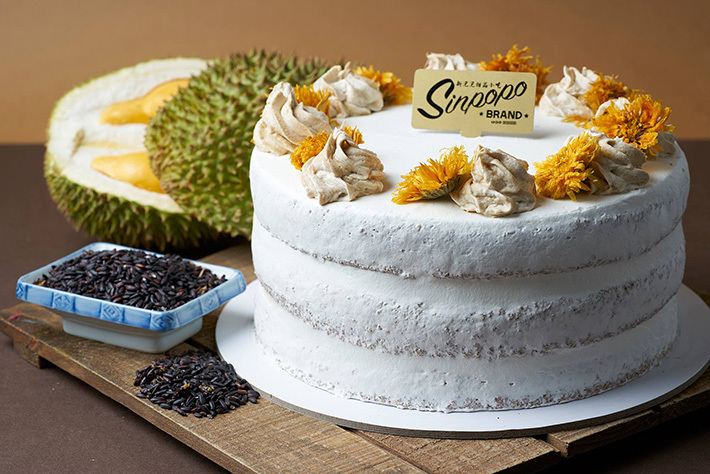 Discover Durian Pulut Hitam Cake (S$68 for a whole cake) at Sinpopo Brand by the people behind Awfully Chocolate. 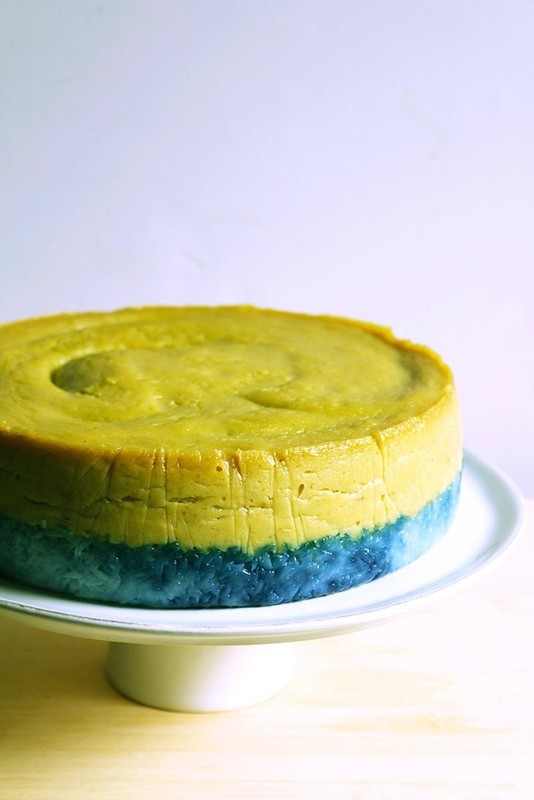 Creamy durian is served between light gluten-free cake layers that are made purely from black glutinous rice flour. It is flavourful yet moist so you get the essence of the dessert it’s inspired by without it getting cloying too fast. 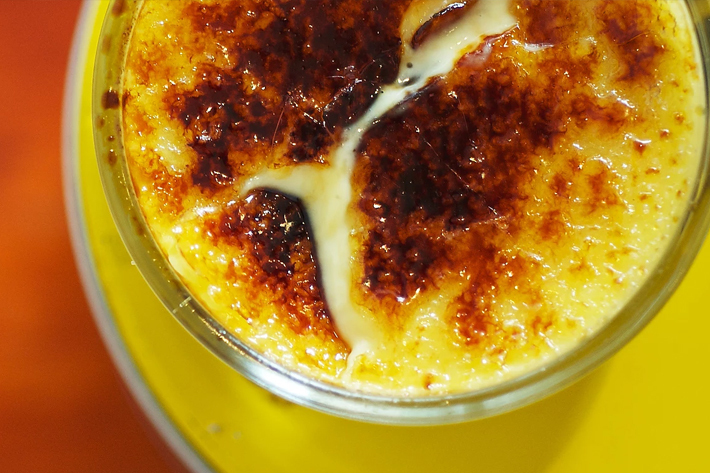 The Quarters has a localised crème brûlée that is a rich, creamy-smooth custard made with Mao Shan Wang Durian and topped with a layer of brittle caramelised sugar. As your spoon dredges up their Duriancanboleh custard, its thin layer of the burnt caramel shatters easily. It’s fragrantly saccharine, thick, and sweet with a slight bitterness. This one might even be better than the usual vanilla version. Chalk Farm’s rendition of the traditional dessert kueh salat comes with a special ingredient: durian. Here, the usual coconut pandan custard is swapped out for a creamy layer of durian custard that is made from Mao Shan Wang durian flesh. Paired with the glutinous rice, the two come together to create an interesting mixture of textures and flavours that go surprisingly well together. If you feel like having your durian cold, you can always try Dessert First’s Durian Snow Ice. 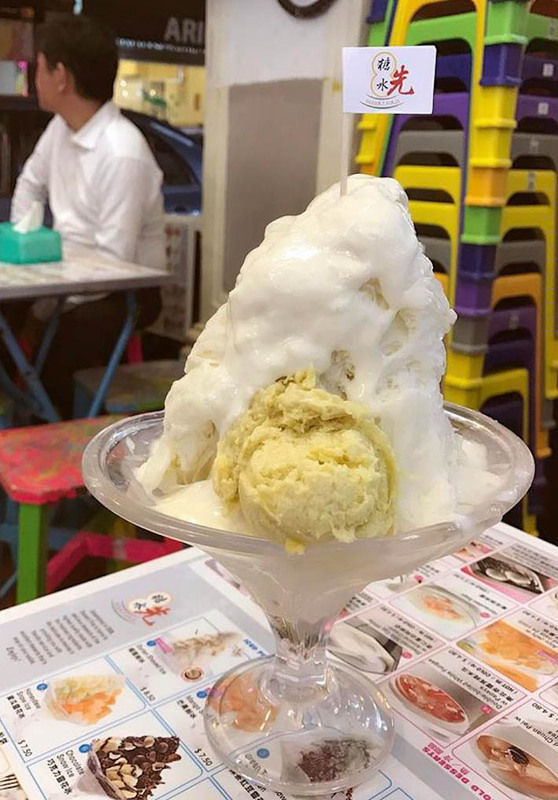 The shaved ice dessert is topped with a generous serving of D24 durian flesh as well as a scoop of mouthwatering durian ice cream, making it the perfect dessert to have to combat Singapore’s sweltering heat! Not only does Ding Dong’s Durian Alaska have durian in it, but it also looks like one too! The thorny dessert is essentially a classic Baked Alaska that is given a local twist by using ingredients such as durian kaya, pandan chiffon cake and durian ice cream. 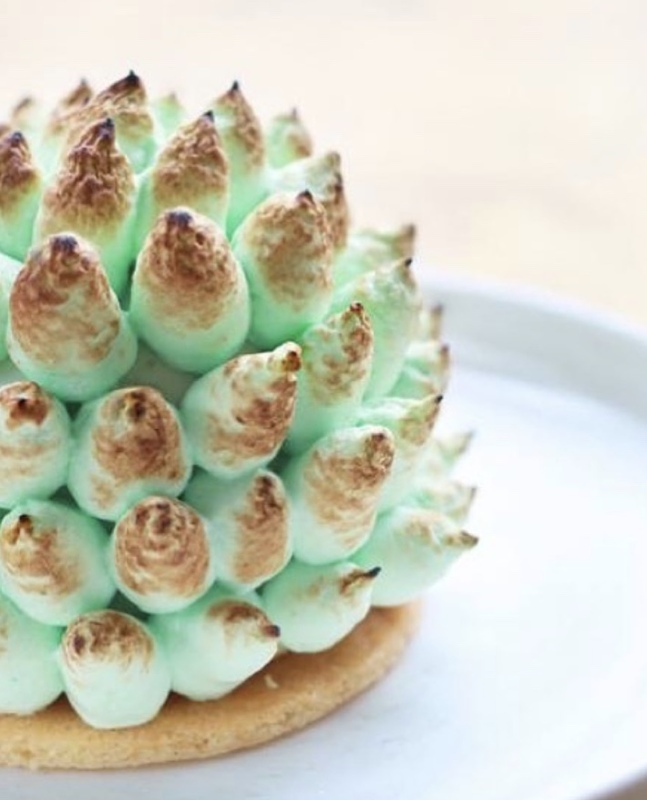 The spikes of the dessert are then made with torched pandan meringue. It certainly is one of the more eye-catching desserts on this list! 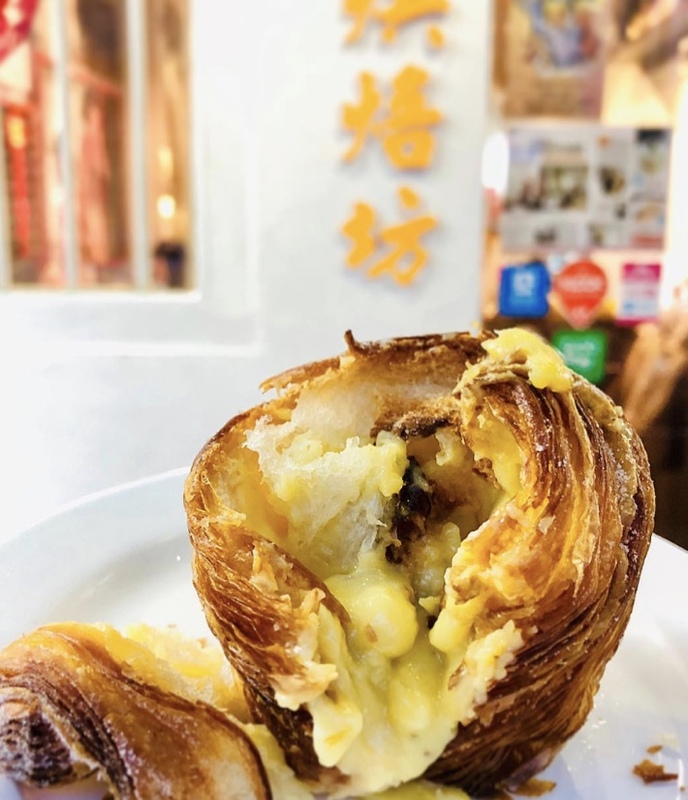 If you love pastries as much as we do, you’d be glad to know that Keong Saik Bakery sells these beautiful golden brown Mao Shan Wang Lava Croissants. Each croissant is filled with a generous amount of luscious Mao Shan Wang cream which oozes out when you tear away at the croissants flaky exterior. Lokkee’s Fried Durian is a sweet, crispy treat that provides the diner with a symphony of sensations on a whole new level. 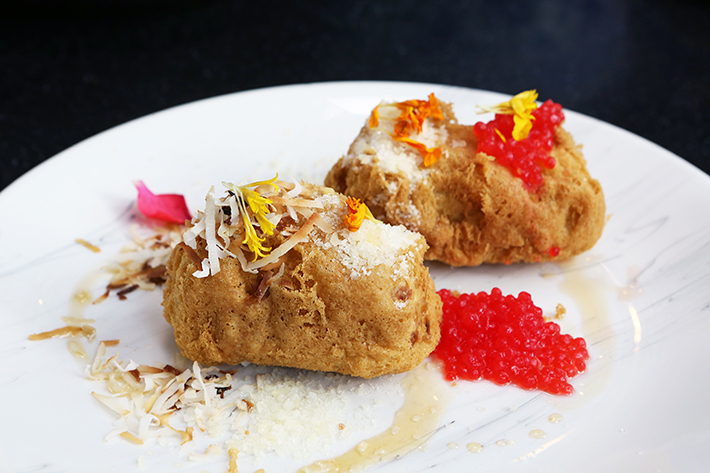 Here, a deep-fried durian fritter is accompanied by strawberry caviar, popping candy, flecks of flower petals and coconut flakes. The fried durian itself is sweet, velvety and warm like custard and after biting into this piece of heaven, you’d not want to eat durian any other way. 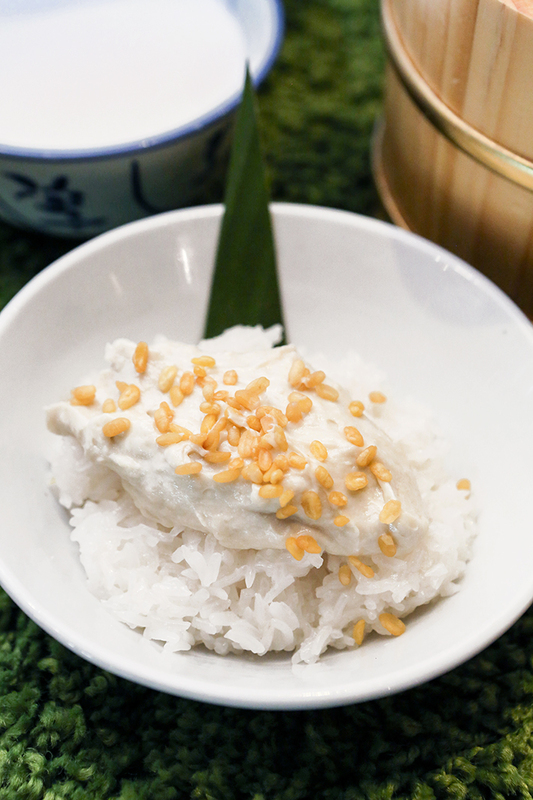 We’ve all heard of mango sticky rice, but have you heard of durian sticky rice? If that sounds amazing to you then you’d be glad to know that Sawadee Thai Cuisine has just that. Instead of mango, their Mao Shan Wang Durian Sticky Rice is accompanied by a massive, fleshy chunk of durian. Durian pengat is one of those durian desserts that will always remain a classic. 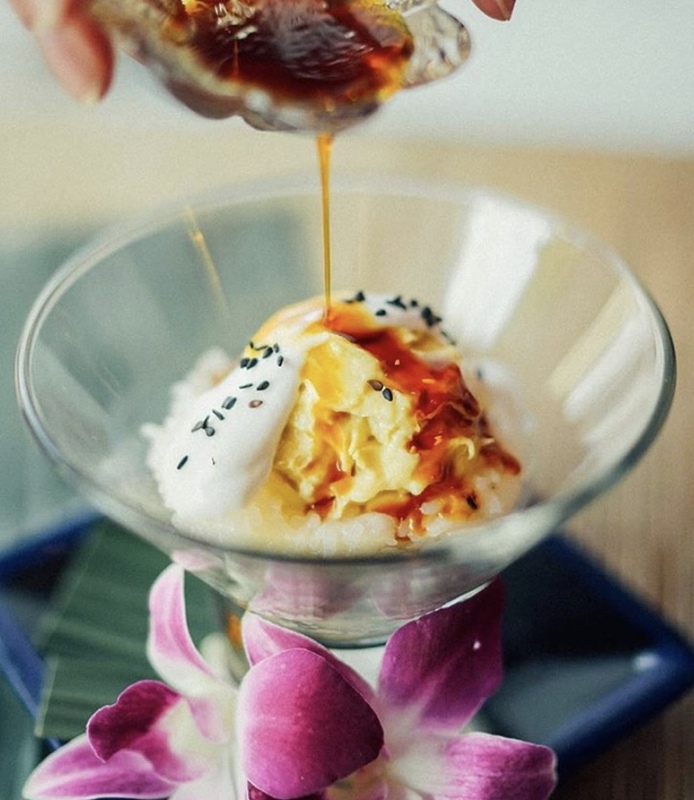 There are a number of places in Singapore that sell amazing durian pengat but one of our absolute favourites with no doubt has to be the one at Spice Brasserie. Sweet, the way it should be, the velvety smooth dessert boasts a buttery flavour which is a reflection of the high-quality durians that they use, and on top of that, it’s accompanied by sticky rice and salted coconut cream. 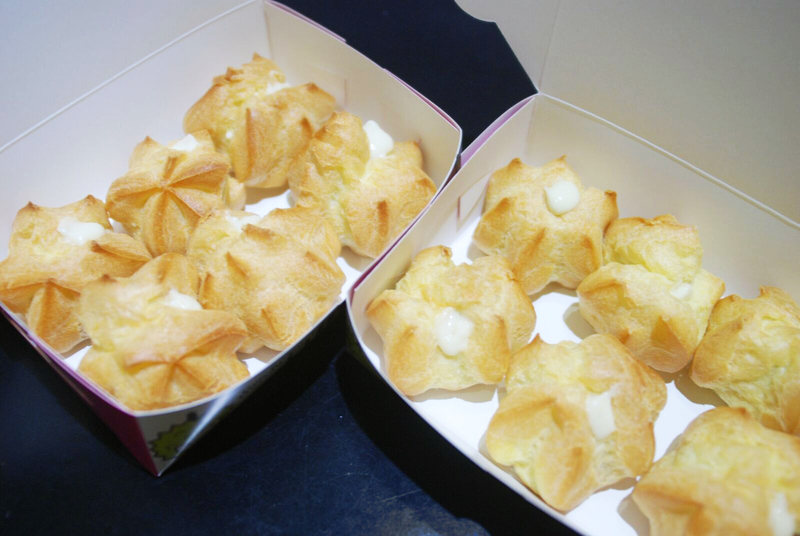 Durian puffs are pretty common and readily available in most places islandwide. However, one of the stalls that set the bar pretty high is Taste Better. The durian puffs here each come with an incredibly generous amount of creamy, pungent filling that tastes (and feels) as buttery sweet as eating the actual fruit itself.